Definition at line 199 of file llprimitive.h. Definition at line 1800 of file llprimitive.cpp. References f, FLEXIBLE_OBJECT_DEFAULT_AIR_FRICTION, FLEXIBLE_OBJECT_DEFAULT_GRAVITY, FLEXIBLE_OBJECT_DEFAULT_NUM_SECTIONS, FLEXIBLE_OBJECT_DEFAULT_TENSION, FLEXIBLE_OBJECT_DEFAULT_WIND_SENSITIVITY, mAirFriction, mGravity, mSimulateLOD, mTension, LLNetworkData::mType, mUserForce, mWindSensitivity, and LLNetworkData::PARAMS_FLEXIBLE. Definition at line 1866 of file llprimitive.cpp. References mAirFriction, mGravity, mSimulateLOD, mTension, mUserForce, and mWindSensitivity. Definition at line 221 of file llprimitive.h. Referenced by LLVolumeImplFlexible::doFlexibleUpdate(), and LLPanelVolume::getState(). Definition at line 220 of file llprimitive.h. Definition at line 219 of file llprimitive.h. Referenced by LLVolumeImplFlexible::doIdleUpdate(), LLVolumeImplFlexible::getEndPosition(), LLVolumeImplFlexible::getNodePosition(), and LLPanelVolume::getState(). Definition at line 223 of file llprimitive.h. Definition at line 224 of file llprimitive.h. Definition at line 222 of file llprimitive.h. Definition at line 1849 of file llprimitive.cpp. References mAirFriction, mGravity, mSimulateLOD, mTension, LLNetworkData::mType, mUserForce, mWindSensitivity, and LLNetworkData::PARAMS_FLEXIBLE. Definition at line 1814 of file llprimitive.cpp. References f, mAirFriction, mGravity, mSimulateLOD, mTension, mUserForce, mWindSensitivity, LLDataPacker::packU8(), LLDataPacker::packVector3(), and TRUE. Definition at line 214 of file llprimitive.h. References FLEXIBLE_OBJECT_MAX_AIR_FRICTION, FLEXIBLE_OBJECT_MIN_AIR_FRICTION, llclamp(), and mAirFriction. Definition at line 213 of file llprimitive.h. References FLEXIBLE_OBJECT_MAX_GRAVITY, FLEXIBLE_OBJECT_MIN_GRAVITY, llclamp(), and mGravity. Definition at line 212 of file llprimitive.h. References FLEXIBLE_OBJECT_MAX_SECTIONS, FLEXIBLE_OBJECT_MIN_SECTIONS, llclamp(), mSimulateLOD, and S32. Definition at line 216 of file llprimitive.h. References FLEXIBLE_OBJECT_MAX_TENSION, FLEXIBLE_OBJECT_MIN_TENSION, llclamp(), and mTension. Definition at line 217 of file llprimitive.h. Definition at line 215 of file llprimitive.h. References FLEXIBLE_OBJECT_MAX_WIND_SENSITIVITY, FLEXIBLE_OBJECT_MIN_WIND_SENSITIVITY, llclamp(), and mWindSensitivity. Definition at line 1827 of file llprimitive.cpp. 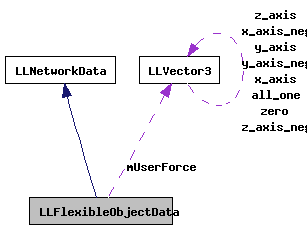 References f, LLDataPacker::hasNext(), mAirFriction, mGravity, mSimulateLOD, mTension, mUserForce, mWindSensitivity, LLVector3::setVec(), TRUE, LLDataPacker::unpackU8(), and LLDataPacker::unpackVector3(). Definition at line 204 of file llprimitive.h. Referenced by copy(), getAirFriction(), LLFlexibleObjectData(), operator==(), pack(), setAirFriction(), and unpack(). Definition at line 203 of file llprimitive.h. Referenced by copy(), getGravity(), LLFlexibleObjectData(), operator==(), pack(), setGravity(), and unpack(). Definition at line 202 of file llprimitive.h. Referenced by copy(), getSimulateLOD(), LLFlexibleObjectData(), operator==(), pack(), setSimulateLOD(), and unpack(). Definition at line 206 of file llprimitive.h. Referenced by copy(), getTension(), LLFlexibleObjectData(), operator==(), pack(), setTension(), and unpack(). Definition at line 207 of file llprimitive.h. Referenced by copy(), getUserForce(), LLFlexibleObjectData(), operator==(), pack(), setUserForce(), and unpack(). Definition at line 205 of file llprimitive.h. Referenced by copy(), getWindSensitivity(), LLFlexibleObjectData(), operator==(), pack(), setWindSensitivity(), and unpack().